brightup has built a pretty remarkable home automation system. The Hamburg, Germany company is planning to launch in the 3rd quarter of 2014. The brightup team told us a little about what we can expect, as well as why they focused on lighting. TechFaster: What does brightup do, and how do you do it? brightup Team: brightup pursues the trend of the Smart Home, which focuses on making everyday life easier and more comfortable for anyone. The brightup system connects your lamps with your smartphone through plugs that work like an adapter. The system can be used and controlled through the brightup app with any iPhone, Android or Windows smartphone. The smartphone works as a kind of remote control. The desired moods and settings only have to be programmed once and from then on, everything works automatically and the smartphone is no longer needed – the system adapts the lighting to the adjustments previously programmed. brightup makes it possible for everyone to live life of the future today through a higher quality of living, more comfort and increased security. No matter where you are, you can always control your lights at home through the app. But this is only just the beginning: brightup automatically recognizes whether somebody is at home and in the case of nonattendance, brightup automatically and randomly turns lights on and off again. Needless to say that this only takes place when it is dark outside. Illumination, according to the police, is one of the most effective burglary prevention devices and therefore increases the level of security for homes. However, brightup not only is of help when the residents are out of the house, but also during their everyday lives. When the residents have leisure time and come home exhausted from work, their already cozy and softly illuminated living room can welcome them. There will be no need to get up from the couch in order to change and adjust the room lighting. 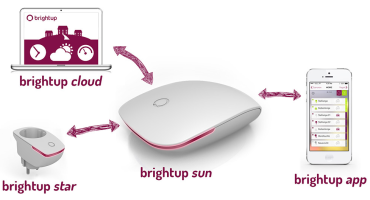 So all activities in the house can take place in a perfect light atmosphere through brightup. At brightup we believe that you shouldn´t take care of your home but your home should take care of you. We believe that through home automation we can improve our quality of life, with comfort, harmony and security. The automation technology has been around in the industry and labs since long time ago, so why don´t we all have it at home? We’ve also tried out the current home “automation” systems and have realized how passive the current solutions are. There has to be a better way of doing it; home “automation” has to brighten up! This lead us to create the best home automation experience ever and we called it brightup: the first step to make homes smarter and comfier. Sebastion, one of the co founders, spent 6 months on a home automation lab, knowing that technology is there, works and is ready for implementation. While in the labs he was always wondering when this technology would finally reach his grandma’s home. That´s why we started talking about it. Then, we tried out the existing products on the market. What a disappointment! The apps are not intuitive, the installation of one of these systems got us into trouble with the janitor. Four engineers trying to install a switch on a wall and we couldn’t make it, we broke the thing… do we need to say more? So we decided to fix this problem and make our human friendly home automation solution. With this goal in mind we started brightup. brightup is launching an Indiegogo campaign in February and requires the help of the community to bring our idea to market. We would like to thank the brightup Team for taking the time to answer our questions.